Is it really your birthday if it isn’t on Facebook? Remembering birthdays has never been easier, very much thanks to Facebook’s zealous reminders in the top right hand corner of our news feed. Whether to catch up with old friends or to interact with somebody with minimal social awkwardness, chances are that we would not have the opportunity to connect with some people if not for these opportune Facebook reminders. On the other hand, Facebook greetings do make birthdays a little more bearable. We’ve all relished that thrilling acknowledgement of our pathetic existence on this earth: after all, we are the “attention-seeking lot”, aren’t we? The inner egoist cheers us on to claim our rightful share of popularity, epitomised by the massive blizzard of wall posts. Not that it matters if half the posts originate from “friends” whom we haven’t met in our lives nor if most of these “well-wishers” can barely be bothered to sacrifice a fraction of their thousand gigabyte brain to remember our special day. Yet, against all ego-coddling temptations, I decided to spend a birthday without — gasp — proclaiming it on Facebook. Of course, it was a tough act removing my birthday. Admittedly, deleting my birthday after its year-long vigil on my page was a pitiful act. Painful, even. But the deed was done. As predicted, only a select few wrote in to convey their greetings. In a span of twenty four hours, the fact that it was my birthday was worthy of less than twenty Facebook responses, not counting those who resorted to more traditional methods. Yet it brought unexpected delight when people did remember it. (Of course, this is discounting those who only realised after seeing other birthday wishes for me on their news feed, but that is — I delude myself — a separate issue) Yes, despite attempts to lie low, I still experienced the small satisfaction that I was appreciated. Except, this time, it wasn’t — I hope — artificial. Yet how much exactly do birthdays count for? They originated as a celebration of survival, since child mortality was so common. Without that factor in the present day, birthdays seem arbitrary and insignificant, notwithstanding the fact that a few million people in the world share it with us. While they are a part of us, perhaps the measure of birthdays’ uniqueness amounts to as much as, say, liking chocolate ice cream. While a friend may be significant enough for us to commit their birthday to memory (or for us to be able to remember their birthday without any conscious effort), friendship should not hinge on something as superficial as that. I hate to confess this but I, too, am wont to rely on Facebook for that nudge to recollect a ‘friend’s’ birthday. This is, after all, a world of many acquaintances and few friends, and Facebook makes it easier to disguise ourselves as the latter, instead of admitting that we’re just strangers connected through a thin filament of the Internet. Sure, persuading yourself that these people were really interested in your “special day” can invoke some joy, but who would be the most likely people to take some time off their schedule just to celebrate your birthday? Surely not one of those random Friends floating around in your ever-expanding list of Facebook pals. As for people who do not reveal their special day on Facebook, reasons range from the practical (“scared of identity theft”) to the disillusioned (“to the people writing ‘happy birthday’ on my wall, I could have been anybody else and they would’ve written the exact same thing”). Without the instruction of Facebook at our disposal, we can be sure of, as Alvin Soh, a Year 5, said, “who really bothers to remember”. So, before you trot off to check whose birthday it is today, it might be worth asking yourself: if it doesn’t mean so much to me, how can we be sure if it means as much to them? We’ll be better off saving the time spent on, as Claire Yip, also a Year 5, aptly puts it, “being nice to a Facebook wall”. As consolation maybe, I received zero happy birthday wishes after removing my birthday from my profile. This is however not equated to having received no well wishes. 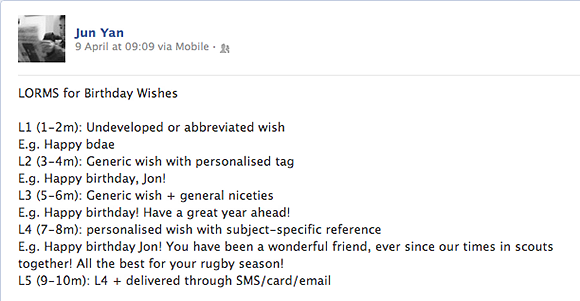 I think my friends’ have realised too, that a wish on Facebook does not signify anything but a very superficial attempt at socializing. In fact, Facebook has simplified things for its users – you no longer have to reach the person’s profile to wish him or her happy birthday. That’s how much effort one has to put in now to convey one’s joy in another’s existence. Which is more often than not feigned or non-existent. Facebook has reduced what could have been beautiful friendships into nothing but wispy threads of Facebook notifications of new comments or likes. Only the destructive relationship between the Internet and the user has been strengthened. Quoting Mr Bilahari Kausikan’s speech, indeed ‘Sincerity is an over-rated virtue, if indeed it is a virtue.’. Sincerity may or may not be a virtue, but it is what will combat Facebook and its perhaps subconscious trivializing of the importance and the essence of friendship.